Because I love Bill Harley’s work—for my money, he’s the finest musician and storyteller for kids in the English language—I wrote a post about him around 18 months ago. After the article appeared on this blog, I reached out to Bill and his wife Debbie to share the link with them. At the same time—without exactly knowing how this could be realized—I asked if they might be interested in coming to Japan. Well, with the strong support of many others—including co-organizer Roger Reinoos—I was able to arrange a small tour which is taking Bill across Japan through the month of November. 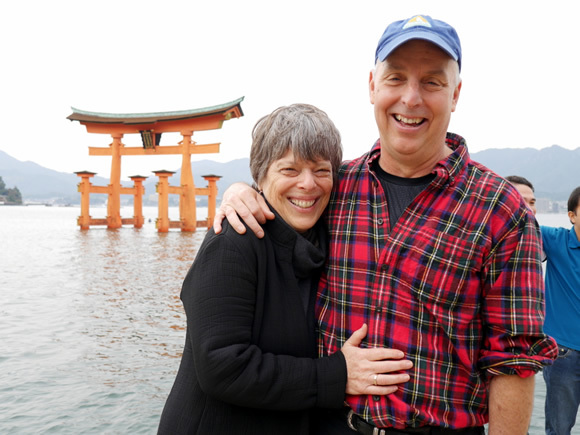 The first main stop for Bill and Debbie was Hiroshima, where they spent five days. 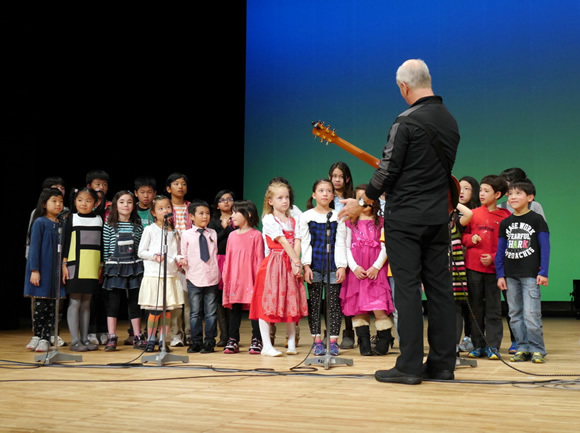 The concert we held on Sunday was a benefit event, with all proceeds from ticket sales donated to the “Kasumi Family House,” a building being constructed near Hiroshima’s largest hospital so families with children who are hospitalized there with serious illnesses will have convenient and inexpensive accommodations. Now that Bill and Debbie have moved on from Hiroshima to continue their tour, I thought I’d share highlights of the time they spent here. In the late afternoon, I welcomed Bill and Debbie at Hiroshima’s main train station. Although I had never met them in person, we exchanged so many messages over the past 18 months that they felt like old friends. That evening we had dinner—joined by Roger—then took a quiet stroll through Peace Memorial Park. 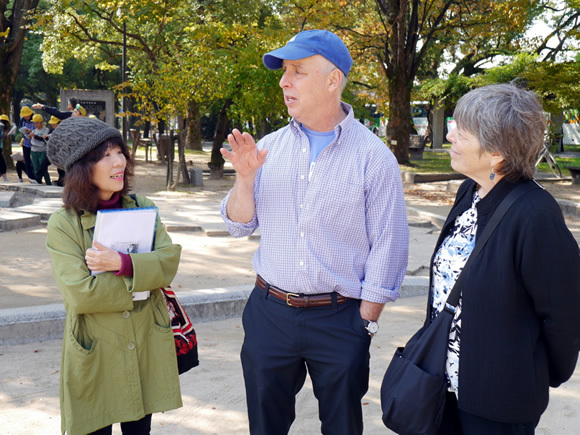 The next morning I met Bill and Debbie at the park for a tour of the A-bomb monuments with my friend Michiko Yamane, a longtime volunteer guide. 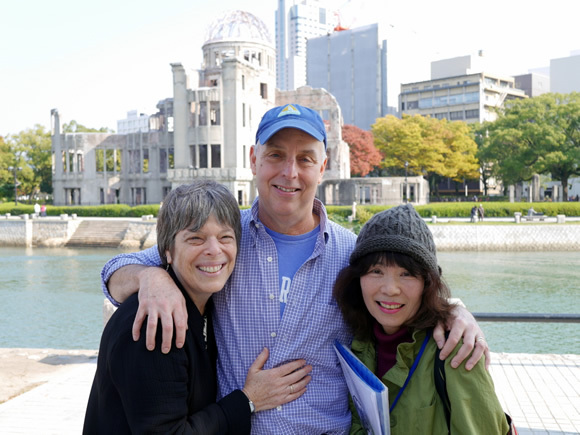 We ate lunch together, then Bill and Debbie spent Friday afternoon at Peace Memorial Museum, taking in the terrible story of the world’s first atomic bombing. 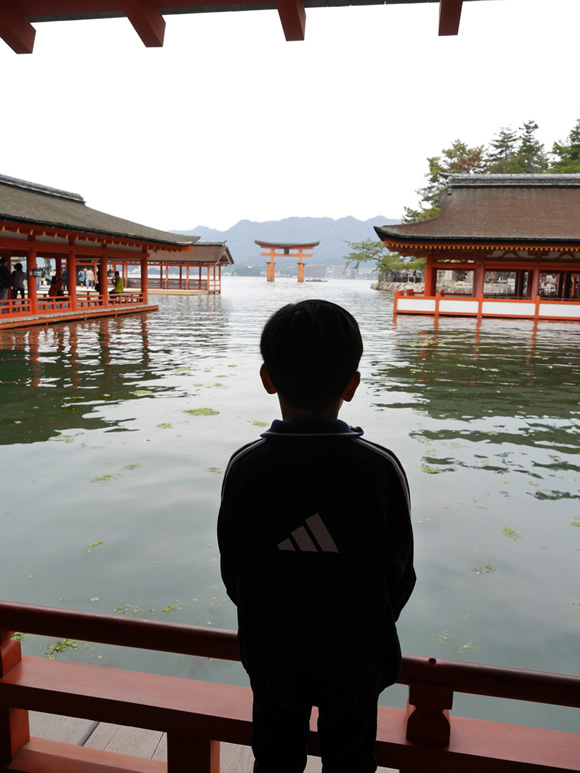 On Saturday morning, my family and Roger’s family (he has a seven-year-old daughter) took a day trip to Miyajima, a well-known island located about an hour from Hiroshima. 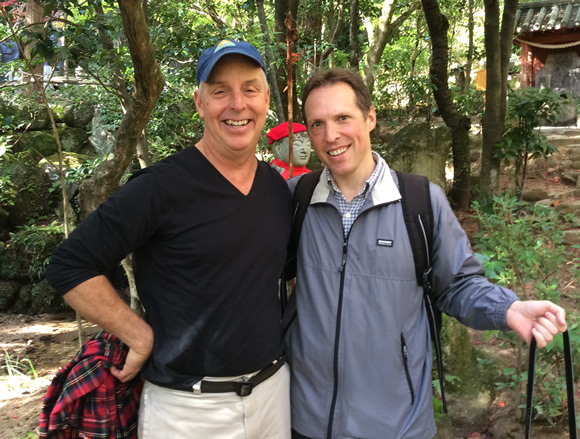 We wandered through the scenic beauty, including the colorful fall leaves; a deer ate part of Bill’s map (there are a lot of tame but hungry deer); we took a cable car to the top of Mt. 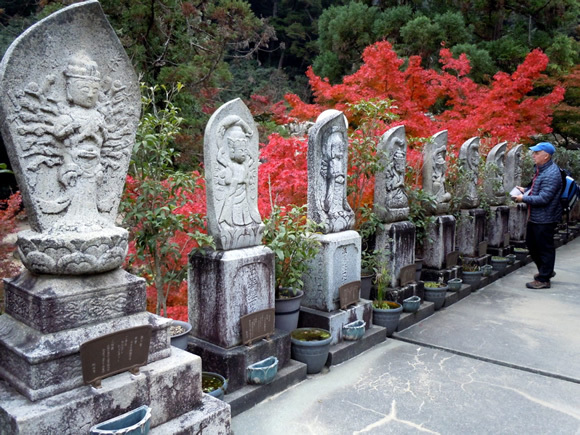 Misen, which rises in the center of the island; and we explored the gorgeous grounds of Daisho-in Temple. 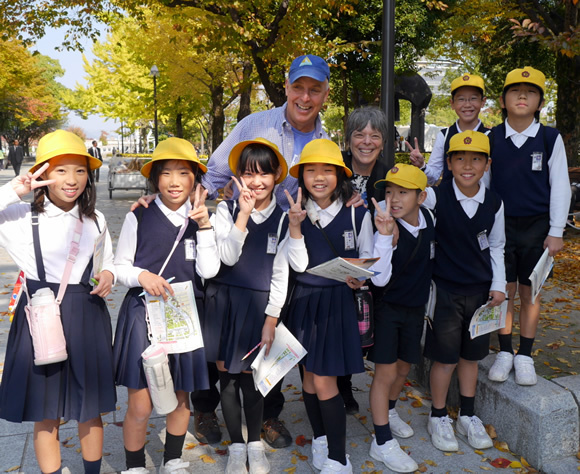 Our trip to Miyajima was also a magical chance for the kids to connect with Bill and Debbie, who treated them with great warmth. 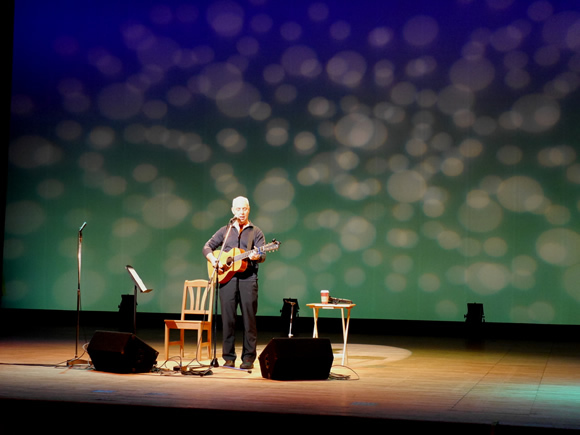 They had listened to Bill’s songs and stories for several years, becoming big fans, and now here he was in Japan, playing with them in person! I think I’ll always remember the train ride home in the late afternoon, Bill sitting with the three laughing children on a long seat, entertaining them with stories and silly games. Sunday afternoon was the concert, held in a hall at Aster Plaza, the largest arts center in the city. Though there were a variety of challenges over the past 18 months, it all came together in the end and Bill’s performance was outstanding: he’s a marvelous entertainer and his joy on stage is infectious. He even wrote a new song with Hiroshima in mind, called “We Sing for Peace,” which he debuted that day. 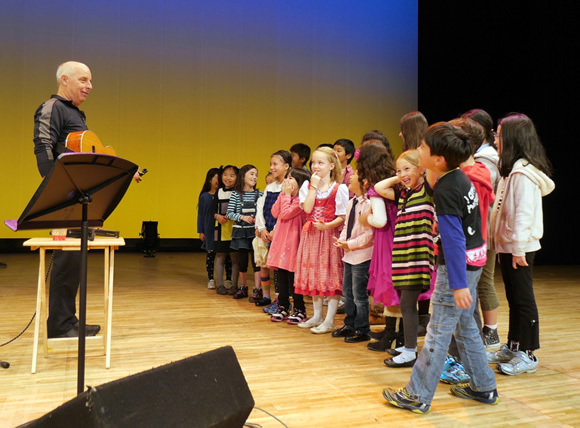 We also arranged for a group of children from Hiroshima to sing several songs with him, which was very cute. Although, as a rule, I try to protect the privacy of my kids by not showing their faces at this blog, they can be seen in these group photos. Do you think you can spot them? 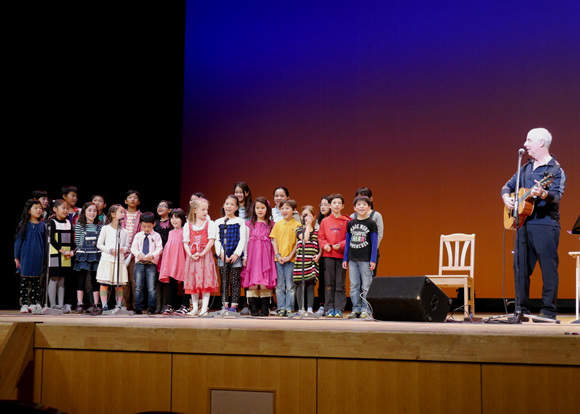 While the concert was a fun experience for all—and no doubt earned Bill many new fans—we also managed to raise about $3000 for the “Kasumi Family House” project. 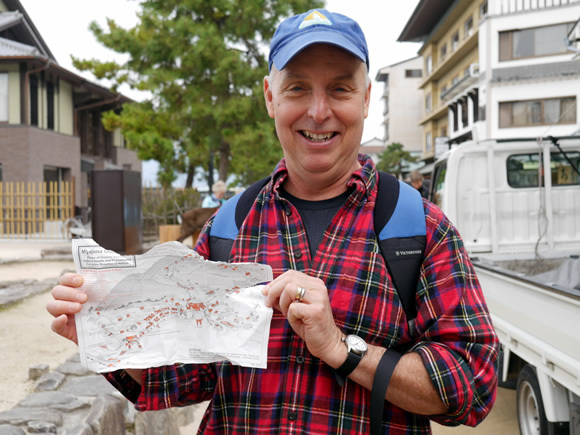 On Monday, their last day in Hiroshima before moving on to tour other parts of Japan, I took Bill and Debbie to lovely Mitaki Temple, where Roger joined us for a walk and then lunch. That evening, Bill gave a talk for the local chapter of JALT (Japan Association for Language Teaching), concluding his discussion of “story” with a long, hilarious song about a boy jumping from a high dive. We had a wonderful five days with Bill and Debbie, an experience that I’m sure will glow in memory throughout our lives. 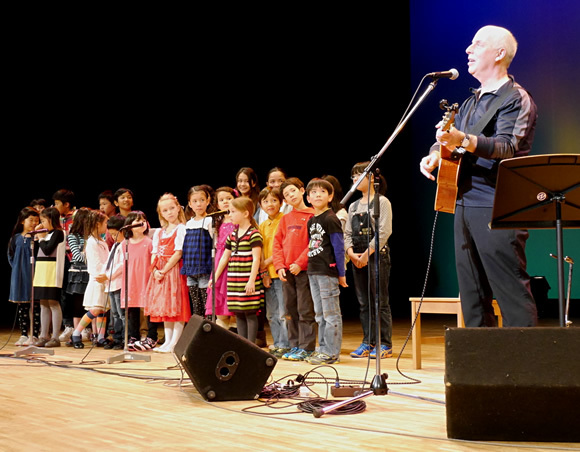 Much like the struggles of the bilingual journey itself, the difficulties I encountered in producing the concert all faded away on Sunday afternoon when I saw the great delight on my children’s faces as they watched Bill Harley perform in Hiroshima. Because in the end, it’s not about the difficulties; it’s about perseverance, and spreading joy along the way. How about you? If English is a target language in your family, I can’t recommend Bill Harley’s work highly enough!